You will need: a strip of thin coloured card or cardboard; scissors; sticky tape; coloured feathers; thick cotton thread; bead for decoration. Cut out a headband from the card to fit around the child’s head. Secure the ends with sticky tape. Let the children choose feathers to decorate the front of their headdress. 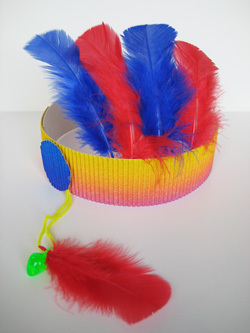 Attach the feathers inside the headband with sticky tape. Cut a length of cotton thread about 20cm long and thread with a decorative bead and feather. Loop the thread and fix to the side of the headband, underneath a circle of card.